Item is a negative featuring an image of a male Kodak employee showing building 3 Sensitizing Roll Storage. For prints see 2005.001.06.03.030. File contains negatives featuring images of a male Kodak employee showing building 3 Sensitizing Roll Storage. For prints see 2005.001.06.03.030. Item is a transparency featuring an image of Toronto City Hall. File contains colour negatives featuring exterior views of Toronto City Hall and Nathan Phillips Square. Item is a mounted, panoramic, aerial photograph of the Kodak Heights complex. Item is a black and white mounted photograph featuring an aerial view showing the construction of Kodak Heights, which began in 1912. File contains tcontact sheets featuring images of Geoff Oliver, Paul Hurley, & Ron Morrison posing individually with the Photo CD. File contains prints of winners of the Family Reunion Sweepstakes receiving their prizes. Winner receives $5000 cash and free airfare, up to ten flights. Shown in In Focus July/August 1985 on page 7, Vol. 31 No. 4. Labels housed with prints. File contains prints from In Focus January 1986, Vol. 32 No. 1. Subjects include snapshots taken at the 47th Kodak Pioneers Banquet. File contains prints and snapshots featuring images of the Kodak building and its visitors at Montreal Expo '67. 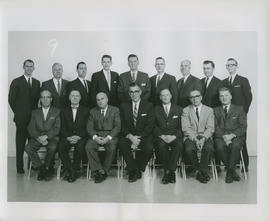 File contains prints of the Kodak exhibits at the Canadian National Business Show of 1963. File contains images from the Canadian Kodak Co., Ltd. victory bonds initiative. Item is a photograph of a procession outside at Kodak Heights, led by a horse-drawn buggy with signs that read "Vote for W.F. Dodd. Item is a photograph featuring an image of a Kodak Heights building under construction. A sign on a neighbouring building reads "Office Entrance". Date stamp on verso. File contains prints and snapshots featuring images from the Kodak exhibit booths at the 1956 Canadian National Exhibition.and the 1956 Pacific National Exhibition. File contains black and white snapshots featuring images from the set up of the Kodak hot air balloon at the Kodak Canada Open House. File contains photographs taken around Kodak Heights during the war years. Included are images of marching bands, people looking out building windows, and victory bonds presentations. File contains prints featuring images of the Kodak exhibit at the 1969 Canadian National Exhibition. Item consists of a photograph featuring an image of a summer themed display advertising Kodak products. At the top of the display is a sign that reads: "take your camera where the fun is..." with an image of five people water-skiing below. File contains images of the Kodak exhibit booth at the CNE, 1965. File contains prints featuring images of the Kodak building, its visitors, and Kodak's involvement in Montreal Expo '67. File contains prints featuring aerial views of Kodak Canada Inc. taken at Kodak Heights in 1988. File contains panoramic prints featuring images of soldiers standing in front of a building at Kodak Heights. File contains prints featuring images of various Kodak Heights. buildings, vehicles and workers. Dates are inscribed on versos. File contains prints featuring images of the Kodak exhibit at the 1967 Canadian National Exhibition. Man on the Street for February 1990 "In Focus"
File consists of contact sheets for In-Focus February 1990's "Man on the Street" feature. Location - Kodak Canada Inc. 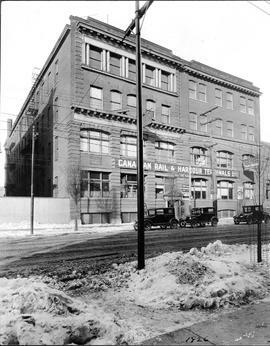 File contains prints featuring images of buildings, factories, dining halls, people and plaques related to the Canadian Kodak Co., Ltd. during the war. File contains prints featuring images of the Kodak exhibit at the 1955 Canadian National Exhibition. File contains prints featuring images of the Kodak exhibits at the 1956 Canadian National Exhibition. 6 prints advertise the Verifax copier system. File contains prints featuring images of the Kodak exhibits at the 1956 Pacific National Exhibition. File contains prints featuring images of the Kodak exhibit at the 1956 Master Photo Dealers and Finishers' Association (M. D. P. F. A.) conference. File contains prints featuring images of the Kodak exhibits at the 1957 Pacific National Exhibition. File contains photographs featuring images of the Kodak exhibit at the 1957 Canadian National Exhibition. File contains photographs featuring images of the Kodak exhibit at the 1958 Pacific National Exhibition. File contains photographs featuring images from the Kodak event, Hommage aux Livernois (1830-1865), a Quebec photographer. File contains contact sheets featuring images of an award plaque being presented. Location - Young and Rubicam Ltd. Item is a photograph of Ron Morrison presenting a cheque to the Hospital for Sick Children. Item is a colour photocopy on plastic featuring an aerial view of Kodak Canada Inc. File contains colour transparencies featuring aerial views of Kodak Heights taken during the 1970s. File contains two transparencies featuring exterior views of building 20, he Kodak PET (Polyethylene Terephthalate) bottle polymer site. File contains exterior views of building 20, the Kodak PET (Polyethylene Terephthalate) bottle polymer site. File consists of 30 black and white photographs featuring views of the Kodak PET (Polyethylene Terephthalate) site from September of 1989. File contains transparencies featuring images of Kodak employees, technology and products, such as movie film and photocopiers. File contains transparencies featuring group portraits of the Canadian skiing team at the Calgary Winter Olympics. File contains transparencies featuring aerial views of Kodak Canada Inc. Kodak Heights location taken in 1992. File contains transparencies featuring images of Geoff Oliver, Paul Hurley, & Ron Morrison posing individually with the Photo CD. Item consists of a poster from the 1995 Halifax Summit, signed by the Prime Ministers and Presidents of Russia, United States of America, France, Germany, United Kingdom, Japan, Italy and the Commission of the European Communities.